George Allan and Margaret Gracie were captured at teh Fans of Altry and shot by the dragoons under the command of Coupland and Grierson of Lag. 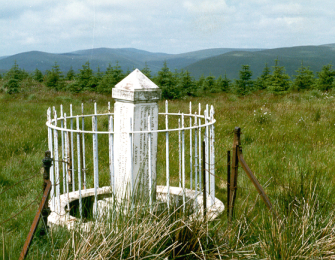 Allan's Cairn is located at the junction of three parishes, high in the hills, and surrounded by forestry. A track from Polskeoch in Glen Scar leads to the memorial. The monument was erecte din 1857. The SCMA paid for new railings around the memorial.